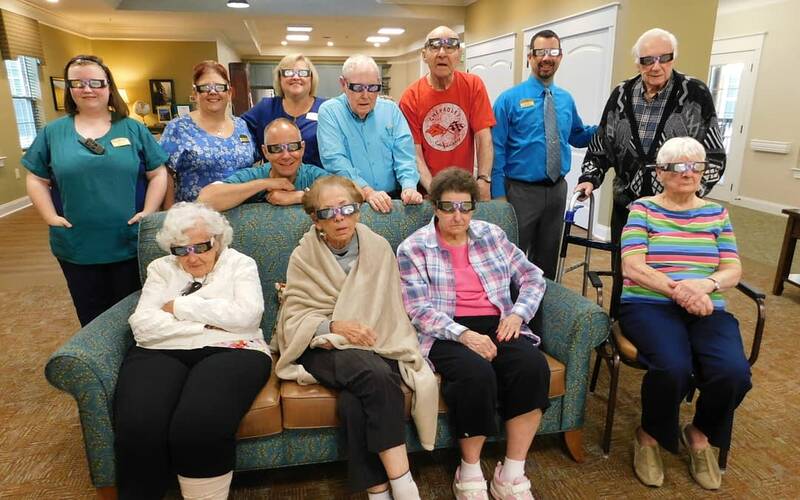 Residents at Morning Pointe of Louisville and The Lamplight at Morning Pointe Alzheimer’s Center of Excellence witnessed a rare celestial event as the Great American Solar Eclipse made its path across the Southeast. It’s likely that many of the residents hadn’t witnessed the heavenly spectacle since 1979. Some Morning Pointe seniors, associates, families and volunteers camped out in the courtyards at the personal care and Alzheimer’s memory care communities. Residents practiced solar eclipse viewing safety with the help of ISO-certified glasses, courtesy of WDRB 41 and WAVE 3 NEWS Station and Rob Thomas. Others observed the spectacle indoors on a projector screen, celebrating with festive hats, decor and “space” snacks. Morning Pointe’s life enrichment and Meaningful Day™ programs give seniors the opportunity to enjoy new experiences with friends, peers and loved ones. Photo: Morning Pointe of Louisville residents Jean Strayhorn and Jewel Dailey got a glimpse of the Great American Solar Eclipse on Aug. 21. Photo: Residents, associates, volunteers and guests at The Lamplight at Morning Pointe Alzheimer’s Center of Excellence, Louisville geared up to witness the solar eclipse on Aug. 21.